In a major upset and in a finish that was the very definition of nail-biting, the underdog New Zealand cricket team has beaten the mighty Australians in a Test match for the first time in twenty years. Doug Bracewell, the 21 year-old scion of the various legendary Bracewells who’ve played cricket for their country, sealed the deal, taking 6 wickets for 40 runs in the second innings, as the Australians, chasing 240 to win, collapsed from 159 to 2 to 199 for 9, before a final partnership of 34 between David Warner (123 not out) and Nathan Lyon (9) brought the Australians to within 8 runs of victory. Bracewell then bowled Lyon, and New Zealand began to celebrate. The win meant that the two-match series was tied 1-1. The Kiwis should be very proud of their achievement, but most fans and commentators saw them as the warm-up act for the Indians, who arrive in Australia very shortly to play a much-anticipated four-test series. The Indians will be mighty contented with the Kiwi victory. Willow.tv, the Internet site that streams Indian coverage, has been running ads that hype the forthcoming series as one of tough men talking trash and fighting hard to see who are the toughest kids on the block. Given how quickly the Australians capitulated to the young Kiwi side under the new leadership of captain Ross Taylor, India–Australia might not be such a close match up. This entry was posted in Australia, Cricket, New Zealand, Test Cricket and tagged Brendon Bracewell, David Warner, Nathan Lyon, Ross Taylor. Bookmark the permalink. Nice article! 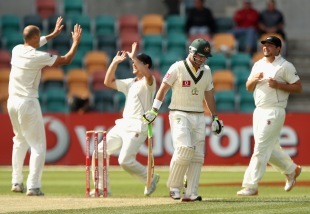 The Aussies may not be the toughest kids on the block, but neither are India in my opinion. It will be interesting to see how the series pans out – as a Proteas fan that has watched his team face both teams recently, I think it will be a good match up. Thank you, Eagerbrad. We’ve added you to the cricket links page, and will be checking you out in the future.